"Why did you sign up for a full marathon, you cannot do this"
"You will be an embarrassment to your family"
"You can't run more than 2 miles without thinking you want to quit, how are you going to get to 26.2?" "You've only ran/walk 6 miles, only 20 to go, ha ha ha"
"You're first marathon is going to be a mockery to other runners"
"3 big races in one month, you will never make it"
Those are recent things I have heard in my brain while running. I was actually being kind above compared to the thoughts in my head. While my July training went pretty well and my June training was pretty decent with an engagement and birthday involved, August has not been my friend. I make non-stop excuses not to run and am living in constant doubt (it rains everyday, I hate the treadmill, the humidity makes it feel more than 100 degrees, I have cramps, etc). 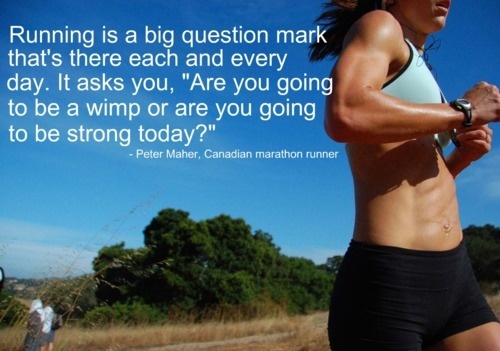 To be honest, I have had to talk myself out of deferring the NY Marathon more than once. First, I am not a quitter. If I had no choice and had to deffer, I couldn't possibly do it next year as I am getting married weeks before the 2014 NY Marathon and the whole reason I signed up was for Disney Dopey preparation <---- Why did I sign up for that??? My friends will say words of encouragement to push me and I jump down their throat, thinking they are coming down on me. I hate the person I have become. Tonight, after I skipped not one but two workouts since Sunday, I found myself excited to get out there and run. Then within the first 1/4 mile, I had issues breathing. I felt as if I was having an asthma attack, which has been absent from my life since 2007. The negative thoughts came pouring in. Then I attacked back. For every negative thought that went through my brain, I told myself I had to run to the next target (stop light, store, building, etc.). This theory is how I started running to begin with - always push yourself to the next stop sign. Next thing I know, I had pushed myself further and faster than I have gone in ages. Probably since December of last year and I could carry on a full conversation afterwards. How is this possible when all the other weeks made me feel like quitting? It's those negative thoughts! What I learned tonight is that my negative thoughts have been my worst enemy all along. If I am able to tune them out by turning them into a positive accomplishment, I can find progress. I need to train myself to look back on today and realize those negative thoughts should push me towards my goal. What do you do to push yourself past negativity while accomplishing a goal? Thank you for this post. The whole time I was reading I kept thinking, that's me! I always have the most negative thoughts. For me it starts almost immediately into a run. Reasons to stop, that I'm not made to run, I don't enjoy this so just quit, etc. But I have also found the same thing as you, if you find a way to defeat those negative thoughts your golden! It's not your body that needs to stop, it's your mind playing games with you. When I want to stop, I picture myself 50 lbs ago before I started running and lost the weight. 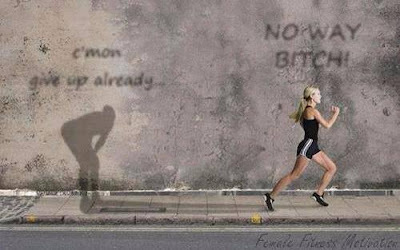 It makes me sick and I tell that fat girl to keep running or else!